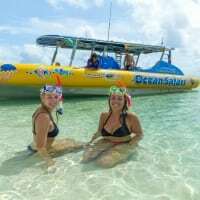 Ocean Safari offers an exhilarating ride to snorkel the pristine untouched Great Barrier Reef off the Daintree Coast at Cape Tribulation. 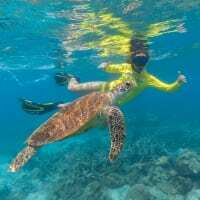 This half day eco tour visits two different snorkel destinations, each with an extraordinary array of marine life and coral species. 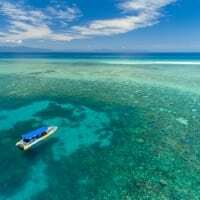 After a fast 25 minute ride, you are ready to snorkel two fabulous locations at Mackay and Undine Reefs. On most days, the rainforest can be seen along the mainland beach whilst snorkelling the Great Barrier Reef alongside sea turtles, which are found in abundance swimming over reefs full of colourful coral, along with myriads of tropical fish, eagle rays, giant clams and starfish. The tour begins at Cape Tribulation beach where you board the vessel bound for the tropical waters of the Great Barrier Reef. The Ocean Safari vessel takes a maximum of 25 passengers allowing you to experience tropical paradise and the pleasure of a small group. The vessel is based on the original design of a rescue craft and is a rigid inflatable boat driven by 700hp engines. 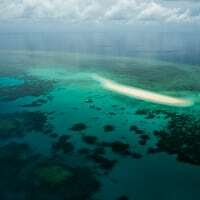 The experienced Skipper and Eco Host ensure the trip is filled with fun and appreciation of the Great Barrier Reef and the coastal rainforest of the Daintree, two world heritage areas side by side. Magical memories like these sometimes only happen once in a lifetime. Courtesy pickups from Cape Tribulation accommodation are included and the Ocean Safari tour is proud to have Advanced Eco Accreditation. Ocean Safari is located onsite at Safari Lodge, offering Safari Hut and camping accommodation in the tropical rainforest, and the Turtle Rock Cafe, so you can eat, stay and play in the one location! This afternoon tour runs regularly July-October, and on demand the rest of the year. We also have a morning tour which is available year round. *Please note: The above tour itinerary is a guideline only and is subject to change depending on tide, wind and other weather conditions. Cancellations up to 5pm the night before departure date receive 95% refund. Cancellations after 5pm night before departure date – no refund. 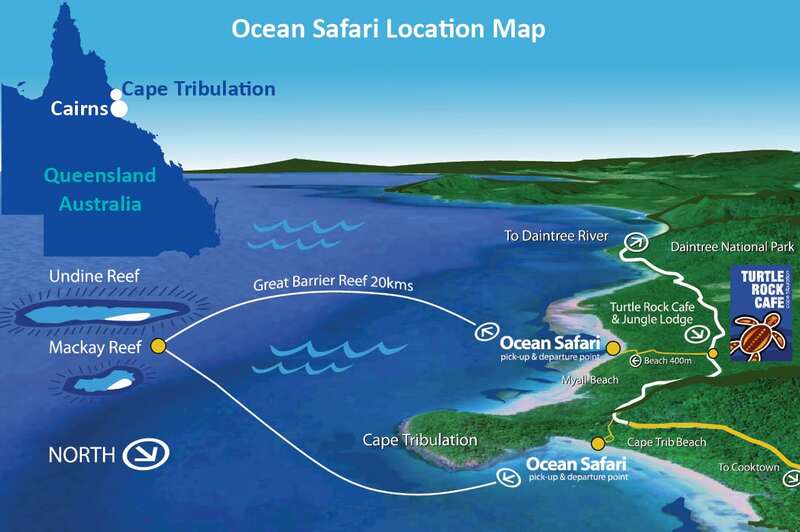 Please call Ocean Safari 48 hours prior to departure on 07 4098 0006 to reconfirm booking and pick up time. For bookings within 24 hours of departure please call 07 4098 0006.